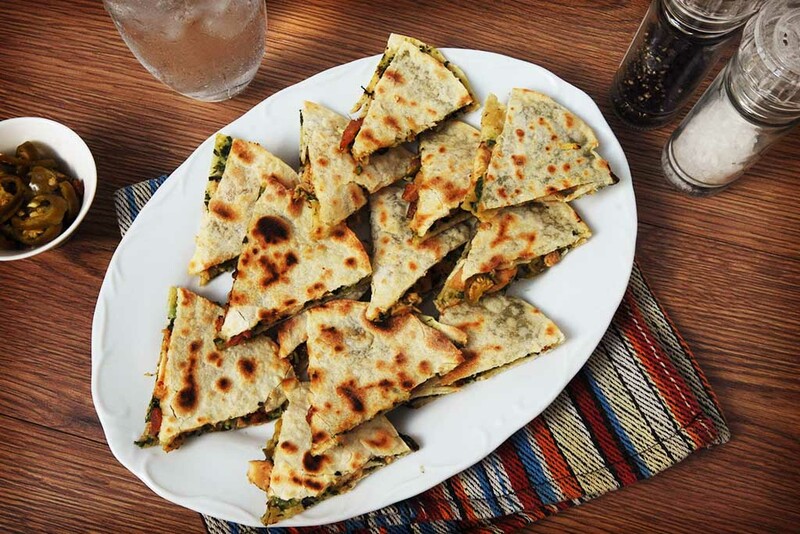 These homemade quesadillas with chicken and cheesy spinach are a quick and easy dinner option and oh so tasty! Slowly add the warm water while stirring until dough sticks Add a little extra water if needed. Place the dough flat surface and knead for about two minutes. Return the dough to bowl and rest for 20 minutes. Heat a pan over medium low heat and grease lightly. Put one Tortilla in the pan and let cook until bubbles form- about 1 minute. Use immediately or store in an airtight container in the fridge or freezer. In a large pan, heat the olive oil over medium heat. Add the chopped onion, red pepper and sauté until soft, about 5 minutes. Cut the chicken breasts in thin strips and season with salt and pepper and smoked paprika. Add chicken strips and bacon bits to the onion and red pepper and cook through. Place mixture on a plate and let it rest. Defrost Nuveg spinach portions in a bowl and spread over one side of the tortilla. Spread cheddar cheese, olives, bacon bits, chicken mix and jalapeno over the tortilla and place another tortilla on top. In a medium heated frying pan, gently place the quesadilla in the center (use a spatula if needed). Cook for 2-5 minutes until golden brown and carefully flip the quesadilla over, and then cook on the other side until golden brown. Serve hot with sour cream or sweet chili sauce. Slowly add the warm water while stirring until dough sticks together. Add a little extra water if needed. In a large pan, heat the olive oil over medium heat. Add the chopped onion, red pepper and saute until soft, about 5 minutes. Cut the chicken breasts in thin strips and season with salt and pepper and smoked paprika. Add chicken strips and bacon bits to the onion and red pepper and cook through. Place mixture on a plate and let it rest.